Steering Committee member, “Mell” Chapple. Mell was an educator, a heritage activist, independent business owner, research consultant, project manager and above all, a true friend who not only loved life and her family but loved the challenges of defending Heritage. Mell passed away on Friday, January 7, 2011 after suffering from cancer. She was an educator, in the Kawartha Pine Ridge District School Board in Special Education; a researcher with the Ontario Ministry of Culture and a founding member of Heritage Ontario. Mell was an educator, a heritage activist, independent business owner, researchconsultant, project manager and above all, a true friend who not only loved life and her family but loved the challenges of defending heritage. Award, which honors preservation and restoration achievements in Port Hope. was a true credit to her friend and mentor, the late A.K. Sculthorpe. be dearly missed by all of us who had the privelige to call her our friend. Carleton University is launching a new Bachelor of Engineering in Architectural Conservation and Sustainability that will meet a growing demand in the field. The program, which begins in September 2011, will focus on the restoration of heritage structures, the reuse and retrofit of existing buildings and the design of new energy-efficient and environmentally friendly buildings. "As the design and construction of sustainable buildings requires close co-operation among the team of architects and engineers, this new interdisciplinary program will meet this need by producing graduates who will follow green principles and practices," says Rafik Goubran, Dean of the Faculty of Engineering and Design. Students will be able to choose one of two specializations. The structural stream will concentrate on conservation and sustainability in the design of new structures and the assessment and retrofit of existing structures. The environmental stream will focus on sustainable building practices with an emphasis on water quality and conservation, air quality, life cycle analysis and disposal of materials and waste streams. In their final year, the students will complete a specialized design project requiring them to solve real-world problems in their respective areas. They can also pursue co-op placements. The program has been designed to meet the strict professional and academic requirements of the Canadian Engineering Accreditation Board. "This degree will give our students an opportunity to incorporate cutting-edge research and technologies into the design of buildings that work with our environment," says Engineering Professor Paul Van Geel, who helped design the new program. "For example, students will learn how to use natural light more effectively to reduce energy demands for heating and cooling while also using the sun's energy to produce solar power. And students will learn how to use our water resources with rain-water and grey-water recycling through to the design of green roofs that control and filter storm water runoff." Students will have access to top-notch faculty, some of whom are already helping to produce green engineers through Carleton's Bachelor of Engineering in Sustainable and Renewable Energy Engineering program that was launched two years ago and a Master's degree in sustainable energy engineering and sustainable energy policy that started last fall. The university has state-of-the-art engineering labs and architectural facilities, considered among the finest in North America. More information about all of Carleton's engineering programs is available at http://www2.carleton.ca/engineering-design/. Carleton is becoming a leader in environmental stewardship. The university established a Sustainable Energy Research Centre (CSERC) to research innovative community-based ways to reduce energy consumption. Aspiring architects have an opportunity to model a sustainable village in Batawa, Ontario and their School of Public Policy and Administration is helping to shape debate and regulation on the environmental front. Carleton is engaged in an aggressive campaign to make the campus more sustainable. I betray my age when I can say I remember the 45 foot height bylaw enacted by Mayor David Crombie. In its day that emergency bylaw bought time for the city to plan. We are again in a period of runaway development, and while there is policy in the City of Toronto on how tall buildings should be built, there is nothing on where they should go. That lack of policy has resulted in piecemeal decision-making and open warfare between Toronto’s residents and the development industry. This week I sat in on a presentation to the City of Toronto’s Design Review Panel of the Tall Buildings study, which recommends policy for development in downtown Toronto. At this stage, this is a report for discussion. It has not been adopted by the planning department or Council, but nonetheless represents a huge commitment of time and resources to bringing predictability to development in Toronto. It recommends where tall buildings should go, and by default, where they should not go. There will be public meetings on this report over the next few months. The Planning Department is hoping to have policy in place by the end of 2011. The general urban design recommendations for towers are good and reflect the best features of successful recent developments projects. Most members commented that this report collects many of the things that the Design Review Panel has been promoting, such as respect for heritage buildings, a regular podium height, mixed use, transparent frontages at the street level. But, and it’s a big but, the heights policy has not been adequately studied with regard to its potential impact on Toronto’s heritage fabric. Inviting Demolition by Neglect: If adopted without significant modification this tall building policy will encourage demolition by neglect. The report concentrates very tall buildings in the downtown between Jarvis and Bay Streets, and Bloor to Front Street, with the tallest buildings along Bay Street and in the financial district. It goes to great pains to say that heritage buildings will be protected as always, (not very well in my experience) and that the height controls won’t trump heritage protection. Forgive my skepticism, but stronger language than business as usual for heritage buildings will be needed to protect anything in the face of major increases in as-of-right permissions, not to mention the extra maximum heights that may be granted through Section 37 negotiations. There was quite a lot of discussion about mixed use, and fine grained retail, but the recommended permissions granted will create huge redevelopment pressure on the remaining small scale retail and historic buildings such as the two former bank buildings and theatres along Yonge Street south of Dundas, along the full length of Church, Jarvis, Bloor, Wellesley, and Carleton, as well as on College from Jarvis to just west of Queen’s Park. Queen Street west of Bay Street, and Spadina are not identified as a zone for tall buildings, hence may become the lone surviving fine grain retail districts in the downtown. Impact on Landmark Views: Panel member Robert Allsopp (declaration, my husband) pointed out the weaknesses in the views protection. He noted that the 1996 Official Plan had 9 protected views, this study recommends protection for only three, Queen’s Park, New and Old Toronto City Hall. Allsopp is an expert in views protection, having been one of the consultants for the successful height control regime that protects selected views of Canada’s National Symbols. The report has some very fine language on the importance of protecting the views of major heritage landmarks, but on close examination it is clear that the impact of buildings at the heights proposed has not been adequately studied and will result in towers being visible above the rooflines of the very views the study claims to protect--buildings which the consultants identify as the most important heritage buildings in Toronto, the Legislative Assembly at Queen’s Park and our new and old City halls. The impact of tall buildings on a number of other key views, such as Knox College, St. James Anglican Church, Metropolitan United Church, Osgoode Hall, internal views at the University of Toronto or Queen’s Park from the north, was ignored. It was not clear how much computer modeling was done in selecting the vantage points for the three protected views. There is lots of flowery language recommending protection for both the views to the buildings and for the building silhouettes, but the selected vantage points are set so close to the buildings that it reduces the protected views to token experiences. From longer distances the viewer would see major intrusions in the background. As a check I compared the recommended heights to protect Queen’s Park in the Heritage Impact Assessment (HIA) prepared for the City of Toronto by Herb Stovel and ASI to those in the Tall Buildings study. Stovel and ASI looked at the maximum heights at Yorkville and Avenue Road, the site of the controversial proposal at 21 Avenue Road. Yorkville is two blocks north of Bloor so buildings in this location would appear smaller than buildings of a similar height at Bloor Street when viewed from the south. The HIA recommends a maximum of 49.5m to protect the silhouette as seen from Queen Street, 73m to protect the same view from Gerrard, and 119m to protect from the view from College Street. The Tall Buildings study recommends a maximum height at Bloor and Avenue Road of 137m. Who knows why there is such a difference in the recommendations, but clearly more work is needed to be sure that the heights permitted will actually protect important Toronto viewscapes. When questioned by Mr. Allsopp whether this extra work will be done, the consultant said the report is finished, and that they were not planning to do any further studies. “If you or community groups want to take on that work it would be most welcome” said Frank Lewinberg, of Urban Strategies. I’d say City Planning and Heritage Preservation Services need to do more than hope that community groups will step into this breach. The National Trust has just released this extensive manual "to answer questions and respond to issues that frequently arise regarding best practices for the care of structures and landscapes. While this manual includes many policies specific to National Trust Historic Sites, its content and format may also be useful to historic sites and buildings across the country. One very helpful chapter is the Sustainable Practices (Chapter 13, page 80) and includes advice for making your site greener - both through capital improvements as well as green housekeeping." It looks interesting; see more at the National Trust Historic Sites Weblog. I had thought that Nelly McLung had originated the above phrase but see that my mind is playing tricks on me. Never Give Up-Never Give In has been a motto for activists, and expresses an important sentiment. I have been told by John Sewell many times, that “one can never quit” you never know how the opposition is going to fail, but if you keep pressing on, sooner or later something, often something you can’t predict, happens and things turn your way. The fight to protect the views of Queen’s Park is at a dark depressing moment now, with the Premier continuing to abdicate responsibility, hiding behind the cloak of politesse for municipal process, “respect for the people of Toronto and the decisions of duly elected politicians”. Those politicians did everything they could in the absence of provincial support. Now is the time to Never Give Up, Never Give In. Why the Premier and the Ministers of Culture and Municipal Affairs and Housing refused to intervene in the OMB case in a timely way is anyone’s guess. Why did the Minister of Culture and the Minister of Municipal Affairs and Housing ignore advice from their own staff, as well as pleas from the ACO, the public, the Editorial staff at the Toronto Star, and the chair of the Ontario Heritage Trust Lincoln Alexander to declare a provincial interest. If they had declared a provincial interest at the OMB hearing, it would have almost certainly guaranteed defeat for the proposal. Instead they left the Speaker in a very weak position to launch an appeal, which was ultimately unsuccessful in the absence of adequate policy at either level of government. At this stage, McGuinty is still playing games with the dignity of the most important building in Ontario, the seat of our democracy. He has the ability to pass a bill to prevent this development. Rosario Marchese, has a private members bill that he could bring forward for debate, or McGuinty could introduce a government bill. Please call, email, or write your MPP to urge them to act now before it is too late. And don’t let them snow you with nonsense about Toronto citizens having spoken, or the court decision is final. Ask them to stop this development, and start working with the City of Toronto to stop further damage. It is time for the “After you Alphonse” between the two levels of government to end. Construction on two highrise condo towers just north of the Ontario legislature in downtown Toronto will not meet any further provincial opposition, even though they will mar views of the historic building, Premier Dalton McGuinty said Wednesday. With a provincial election less than nine months off, McGuinty signalled he's not about to cross newly elected Toronto Mayor Rob Ford by trying to block the 44- and 48-storey towers from being built. "I think we've exhausted the opportunities that were there for us to pursue," McGuinty told reporters. "Ultimately, I think the people of Toronto have the right to decide on something like the building height restriction within their community." A clearly frustrated legislative Speaker Steve Peters, who has been fighting the condo project, said the two towers will undermine the grandeur and importance of Queen's Park. "I don't think that we as members of the 39th Parliament want this to be one of our legacies," Peters said in an interview. "It's a decision that isn't retractable; it's not something that a future government can fix down the road." The province tried blocking the condo towers at the Ontario Municipal Board and in court, but lost on both occasions, said McGuinty. The premier rejected the idea of legislation to protect the views of the 118-year-old legislature, known affectionately as the pink palace. "Would we overturn the expressed desire of the people of Toronto? Would we overturn what they said at the OMB, at the court?" McGuinty asked before answering himself: "I think not." Peters said he wasn't convinced the two huge condo towers were actually "the desire of the people of Toronto," and expressed disappointment in his own government for failing to take action. "I just can't understand why when you've got the most important building in the province of Ontario and the opportunity to protect it forever, why the government won't step in," he said. "I have done everything that I possibly can, but I believe that we're failing the citizens of Ontario by not protecting this in perpetuity." The Architectural Conservancy of Ontario applauded Peters for his passion in trying to defend the legislature's views, and said it was wrong for McGuinty to fail to take action to stop the condos. Queen’s Park has lost its fight to preserve one of Toronto’s most prized heritage vistas. The Legislative Assembly of Ontario has been blocked from launching a court challenge to a controversial plan to build two condominium towers that will dramatically alter the postcard image of the historic building that houses the provincial government. The OMB declared in its decision last March that replacing the Four Seasons Hotel on Avenue Road with 48- and 44-storey condo towers was consistent with provincial and city planning policies and rejected arguments that the project will undermine the views of the legislature. But heritage experts have raised alarms about the project, saying the proposed towers will poke up from the gables of the 118-year-old provincial legislature, one of Toronto’s best-known landmarks, and alter the skyline looking north on University Avenue toward Queen’s Park. The experts criticize Premier Dalton McGuinty’s government for not attempting to block the condo towers and for not putting heritage legislation in place to protect Queen’s Park from real estate projects that compromise the skyline surrounding such an historically significant building. Government members did not seek standing at the hearing in 2009 before the OMB on the condo project. It was left to Steve Peters, Speaker of the legislature, to oppose the project at the hearing on behalf of the Legislative Assembly. He could not be reached for comment Thursday night, so it is not clear whether he plans to appeal the ruling to a higher court. He has said the condos will have a negative impact on the view of the legislative building. Editor's Note:Write your premier, MPP, Toronto Councillors, ask your friends who are veterans to write, The province and the City of Toronto need to start co-operating on this file, instead of passing the buck back and forth. The Ontario government will not take steps to preserve the picturesque setting of the provincial legislature, despite criticism from the Speaker’s Office and measures in other regions across Canada that protect historic buildings from commercial real-estate projects. Speaker Steve Peters, who lost a court battle this week to block construction of two condominium towers that would intrude on the view of the legislature at Queen’s Park, called Friday on Premier Dalton McGuinty’s government to step in. He said he is “troubled” by the government’s refusal to put heritage legislation in place to protect Queen’s Park from real-estate projects that compromise the skyline surrounding the building. Mr. McGuinty’s lack of action stands in stark contrast, he said, to Ottawa and other capitals around the world, including Washington, that have laws to guard the vistas of historic government buildings. In Ottawa, the Parliament Buildings and the Peace Tower are protected through a height restriction of 300 feet for nearby buildings; it is enshrined in the City of Ottawa’s official plan. And in Victoria, the city has established a zoning circle around the provincial legislature, which has the effect of blocking real-estate development, said an official in the Clerk’s Office. This was the first time Mr. Peters, the Liberal MPP for the riding of Elgin-Middlesex-London, has publicly criticized his own government since he became Speaker just over three years ago. But his comments did not convince the government to change its mind. “The courts have made a decision, and we respect the process that has been undertaken,” said Mukunthan Paramalingham, a spokesman for Tourism and Culture Minister Michael Chan. Mr. Peters said he has exhausted all of his legal avenues. His efforts to appeal a decision by the Ontario Municipal Board, giving the green light to the condo project, was the last step available to him. Now that he has lost his fight in the Ontario Superior Court of Justice, there is nothing blocking Menkes Developments, the real-estate company behind the proposed condo towers, from going ahead with the project. Editor's Note:Disappointing, but not unexpected news. Now to the task of protecting what is left. Please write your MPP, and if you are in Toronto, the mayor. It’s one of those buildings that has an understated elegance no matter what the season. In summer, the leafy gardens behind Queen’s Park are a shady spot for a quiet lunchtime break. In fall, the leaves turn gold and red and give the building a mellow warmth. And there’s a lovely birch tree out front that shimmers in a golden glow on frosty winter nights. And, oh, in spring it is glorious! Brilliant flower borders of tulips and daffodils burst into a blaze of colour. It’s a pretty building. A worthy place for schoolchildren and tourists to visit. Most importantly, it’s the seat of democracy in this province. The place where the issues of the day are debated and where laws are made. That’s what’s so outrageous — and so depressing — about plans to build two condo towers to the north of the Legislature. Towering 44 and 48 storeys, they will dwarf the Legislative Building. It’s a plan Speaker Steve Peters has been fighting ever since he heard about it. With the consent of all the parties, he went to the Ontario Municipal Board on behalf of the Legislature to try to stop the Menkes Developments project. A week ago, he heard he’d lost the right to appeal. The new buildings will be one-third taller than the nearby Four Seasons Hotel, the tallest building so far in the Avenue Rd., and Bloor St. area. “We’re concerned that this view will be lost for ever as a result of this development,” Peters said in a telephone interview. Editor's Note:I don't think I have ever agreed with Christie Blizzard on anything before.....this issue cuts across political lines. After decades of neglect, the King and Parliament neighbourhood has come back to life in dramatic fashion. Loblaw is preparing to redevelop its historic warehouse on Lake Shore Blvd. W. at Bathurst St., although the city hasn’t approved the grocery giant’s latest plan to build a store. City planners say they’re baffled as to why the company is erecting construction hoarding along the west side of the Loblaw Groceteria Company warehouse on the intersection’s northeast corner. In December, the company updated its original 2004 rezoning application, but like the first proposal, the new plan calls for a partial demolition. Loblaw wants to take down the entire warehouse, which was designated as a heritage property by the city in 2001, before restoring the west and south facades, one of the key sticking points for city approval. The four-storey Art Deco warehouse has been vacant since 2000, when the Daily Bread food bank moved out. The brick exterior is in bad shape and some of the distinctive stone detailing at the top is crumbling. The city rejected the company’s controversial 2004 proposal to completely demolish it so as to construct a Loblaw superstore. Once a shining triumph of art-deco design, the decaying building that sits at the corner of Bathurst Street and Lake Shore Boulevard West has been abandoned for more than a decade. But the recent appearance of scaffolding is among the early indications that the building’s owners have begun renovations. Coming soon to the site: a Loblaws store and office space that preserves the historic façade. It’s good news for area residents who had grown accustomed to what appeared to be a massive, forgotten space. Edmond Lynch, who works in the shipping department of a building across the street, said he began to notice the scaffolding last week. This week, some of the older, blackened, plywood panels were removed from the more damaged windows, he said. A remnant of early 20th-century industrial development along the waterfront, the site was once the home of a Loblaws warehouse, with packaging and manufacturing facilities. The building, erected in 1928, is now home only to the pigeons that have found room to nest between the broken window panels. Loblaw declined to comment on the project, but at least one developer familiar with heritage preservation is enthusiastic about the plans. “I think that’s what heritage preservation is all about. It’s adaptive reuse: breathing a new life into old buildings and spaces,” said Paul Oberman, president and CEO of Woodcliffe Landmark Properties, which was behind such restoration projects as King James Place and the LCBO at the North Toronto Station. After reviewing the heritage features of Palermo Village, Town staff are recommending council abandon any plans they have for creating a heritage district there. In a report presented to council on Monday, the Town’s Heritage Planner Susan Schappert said Town staff did not recommend the creation of the Palermo Heritage Conservation District due to the area’s significant loss of heritage resources, changes that have occurred, fragmentation of the urban fabric of Palermo and the distances between clusters of heritage resources. Staff have previously noted these factors make the establishment of a Palermo Village heritage district unlikely to survive scrutiny of the Ontario Municipal Board. Advocates of the Palermo Heritage Conservation District say a heritage district designation is more than warranted due to the unique history that has taken place in Palermo over the years and the history that is still intact there. It looks like the final stop for Freeman Station will be demolition. No private individuals or groups have come forward to save the station, meaning the community development committee will vote Monday night on a recommendation that will direct staff to review options for the “disassembly and disposal” of the station. The news is upsetting for many of those who have a connection to the 104-year-old building. Robin McMillan, a resident who was raised here, has many special memories of the building. His grandfather, George McMillan, was the station agent for Canadian National for about 25 years. The owner of the Federal Building has applied for a demolition permit and a local group of artists are trying to save the carved art work located on either side of the main doors to the building located on Main Street West near Caroline Street. 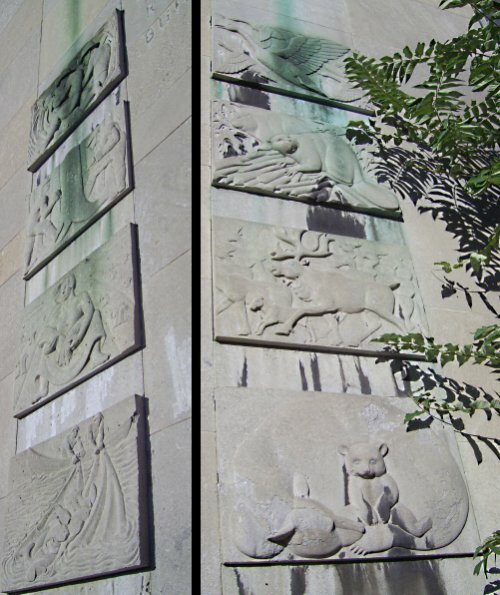 Developer Darko Vranich wants to knock down the former federal government building at Main and Caroline streets — a move that could destroy six relief sculptures on the façade by Hamilton artist Elizabeth Holbrook. Local artists are concerned about a plan they say would destroy Holbrook's first national commission, to clear the way for a 140-unit, 20-storey condo building. It would also remove one of the last structures standing on the downtown block bounded by King, Main, Bay and Caroline streets. The six carvings represent scenes of nature and industry including lumber, mining and other activities important to the development of Canada and Hamilton. They were created when the building was erected in 1954 and were one of Holbrook's first major national commissions. Newfoundland artist Christian Corbet, who studied sculpture with Holbrook, called the façade carvings “historically important” work that captures Canadian history and culture. This architecturaly significant building is an OBVIOUS candidate for Adaptive Reuse. As is all too often the case, the architects are Not mentioned. The former Federal Building was designed by the local architectural firm of Husband, Robertson & Wallace, and was constructed by J.M. Pigott Construction during 1953 and 1954. Lester Birley Husband (1893 - 1972), Hugh Douglas Robertson (b.1900), Arthur William Wallace (1903-78). The former federal office building at Main and Caroline streets is owned by developer Darko Vranich. He wants to demolish it to make way for a condo project. That effort was frozen Thursday when the city’s municipal heritage committee unanimously endorsed calling for historical designation under the Ontario Heritage Act. The effort to get an historic designation of the 57-year-old office building came the same day Vranich and downtown councillor Jason Farr were preparing to announce Vranich had agreed to incorporate the sculptures into his new condo building. For Councillor Brian McHattie, a member of the heritage committee, that’s not enough. Farr said he only learned of the designation effort Thursday morning. On Wednesday he thought he had brokered a deal to save the art work. In a city used to running in circles, what could be more welcome than a new square? If the Entertainment District Business Improvement Association has its way, that’s exactly what we’ll get — a new square on the southeast corner of King and John streets. The plan remains just that, a plan. But already the association has sponsored a design competition for the site and chosen a winner, Coryn Kempster, whose submission, Urban Ballroom, would transform this strangely invisible spot into something more compelling. Kemptser, 36, studied art and architecture at the University of Toronto and Massachusetts Institute of Technology. He also worked for the innovative Swiss architectural practice Herzog & de Meuron. Despite its simplicity, his entry might be just what’s needed to bring life to this neglected corner. The most interesting thing on site these days is the hot dog vendor, which tells you much about the state of a corner that has become much more visible since the Toronto International Film Festival Bell Lightbox opened just across the road last year. Kempster’s ballroom is defined by a “ceiling” of lights and cables. Suspended on steel poles, they are surrounded by rows of trees on all four sides. Beneath is an assortment of large stone spheres that function as seats. Observatory battle. Richmond Hill has gone ahead and accepted the David Dunlap Observatory Lands conservation management plan despite opposition from the land's owner, Corsica, and several residents' groups. Council unanimously adopted the revised David Dunlap Observatory Lands Conservation management plan Monday night, despite pleas for deferral from some residents and the property owner. The plan is what has often been referred to in council chambers as “a living document”, which will set guidelines for alterations and maintenance of items holding natural and cultural heritage significance on the property. Staff responsible for bringing the revised plan to council for discussion met with resident groups and representatives from landowner Corsica prior to Monday’s meeting in an effort to provide further clarity regarding the document. Following his meeting with town staff, Corsica solicitor David Bronskill appeared in chambers Monday night to ask council for plan deferral in an effort to correct what he said is a document based on factual inaccuracies. Many residents in attendance and opposed to Corsica’s planned development on the lands, requested a council deferral also. Holly Fitzgerald called the plan, at best, a safe half-measure that would lead to diminished education opportunities and environment on the land. After the old auditorium at the University of B.C. was earmarked for the wrecking ball two decades ago, Suzanne Poohkay knew something had to be done to save it. The 1925 building had memories, she said, and a strong foundation even though its guts were falling to pieces from neglect and decay. To her relief, the Old Aud was saved — along with 10 other university buildings — as part of a push by UBC to retain and retrofit its aging campus facilities rather than knocking them down to rebuild. The Old Aud, which cost $20.5 million to renew compared with $31.3 million to replace, was gutted and “renewed” into a concert and opera hall that rivals those in parts of Europe, said Poohkay. And along with a new, grander hall, UBC garnered brownie points for reducing its carbon footprint because it didn’t require energy, steel, concrete, water and other materials to build a new foundation, and it resulted in less rubbish being taken to the dump. Natural heritage or historic heritage? Why must it be one or the other? Parks Canada's demolition of the historic Wheeler house in Banff is the unfortunate outcome of a failure to balance competing pressures in the national park, namely between the needs of animals and those of humans. It's also part of a bigger trend of demolition by neglect, a situation that has resulted in much loss of Alberta's historic buildings. The dilapidated 90-year-old summer home of Arthur O. Wheeler was torn down a week ago, despite protests by Wheeler's great granddaughter, historians and at least one university professor, who believed innovative management could have allowed the house to coexist within the sensitive wildlife corridor upon which it sits. The building was historically significant because of its association to Wheeler -- a surveyor, mountaineer and one of the principal founders of the Alpine Club of Canada. Wheeler surveyed large areas of Western Canada, named most of the southern Canadian Rocky Mountain peaks, and was the B.C. commissioner for establishing the B.C.-Alberta border. He built his mountain retreat in 1920, six years before retiring from surveying, and from where he ran a horse-packing and mountain guide business. It's also where he entertained many important guests, as the first president of the Alpine Club of Canada. Toward the end of her life, Jane Jacobs was writing a follow up to her insightful 1969 The Economy of Cities. And while she considered that book probably her most important, she made it clear that some of her observations needed revisiting. After all, she noted, all her writing was based on observation of real life -- how things are, not how they should be, what works and what doesn't -- and, therefore, if things changed in a fundamental way than it behooved any keen observer to take a second look. Sadly, her 'second look' never saw the light of day. Jane loved a good debate and she loved that her writing prompted people to discuss, explore, debate, and even disagree with ideas that needed to be the subject of public discourse. She said in many ways, "don't take my word for it, go observe for yourself." She was forever asking people what they thought, even if they had asked her opinion about something. She thrived on challenges to her observations. Those challenges either brought her new insights or confirmed her own. No one can predict what Jane would say about anything. She was too much of an original thinker to be predictable. But one might assume that she would at least be puzzled – even perhaps amused – by some of the confusion and misinterpretation of her thinking and writing these days, even attributing ideas to her that can not be found in any of her writing or activism. Fortunately, her ideas remain much too popular to be diminished by any of the attempts to undercut her thinking. It is useful to the larger civic debate, however, to challenge some of the misguided assertions about what Jane advocated, thought or caused to happen.